The Nest at Finch Rest: It's All About Flowers! GREETINGS FROM THE FINCH REST & GARDENS! My DH has been planting wildflower seeds the last couple years. It's always a fun surprise to see what will end up blooming. Not sure what this pretty pink flower is - but it was part of his Mega Mix. The Hydrangea is suffering this year. A few of our bushes didn't make it back for some reason. and not producing many blooms. 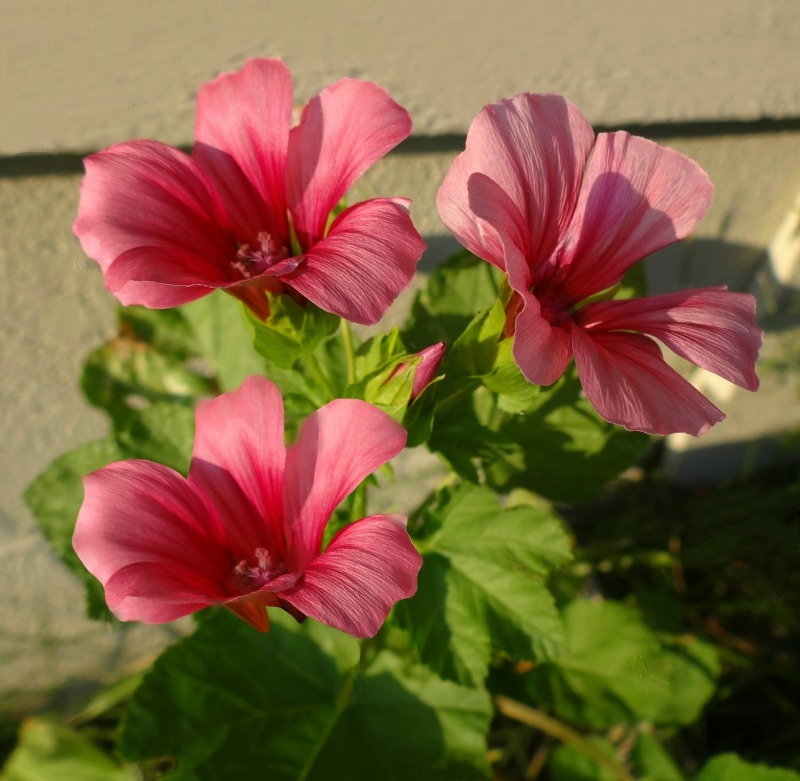 It's only had a few blooms so far - but has very rich healthy green leaves. I have given it plant food & watered it properly. I see no rot or insects. I would blame it on the stifling heat, but the mature established Hydrangeas in our neighborhood are doing well, so it can't be that. Also I have used spent tea leaves and coffee grounds......so truly have tried everything I can think of so far to help it along. Any ideas out there as to why it isn't blooming much? 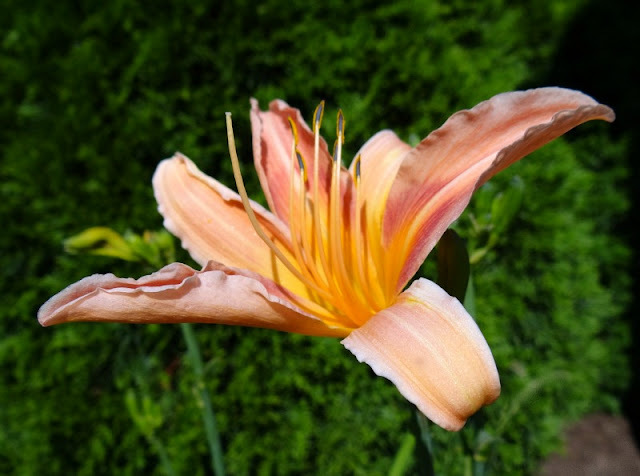 Our younger daughter planted this pretty tropical peach Lily in our garden a few years ago. She is a wonderful & patient gardener and has beautifully worked her loving magic in our gardens many times. The first year this pretty lily only produced one single bloom. The second year we got a couple more, but still not very many....not enough! But THIS year it is blooming and blooming and BLOOMING! Update: those blasted deer ate every single one of these flowers off this plant the very next day! 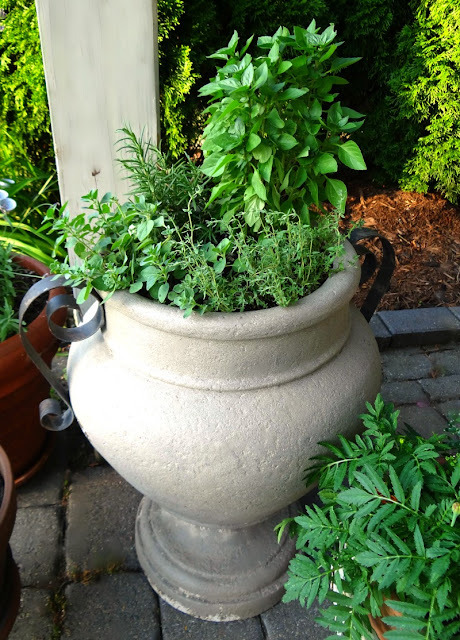 Here is our outdoor urn pot of oft-used herbs. 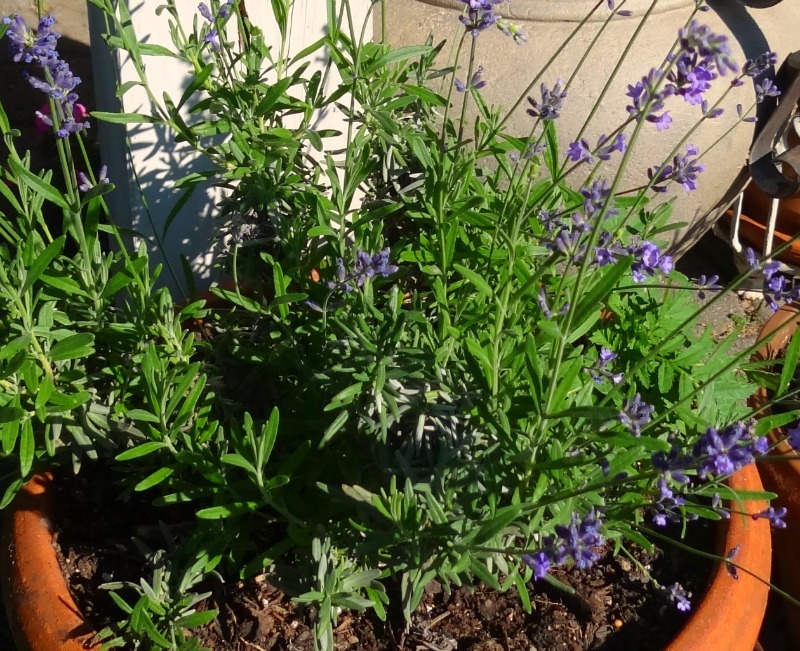 And of course we have everyone's favorite herb of all - lavender. Deer loathe the smell of it, helps keep them away organically. 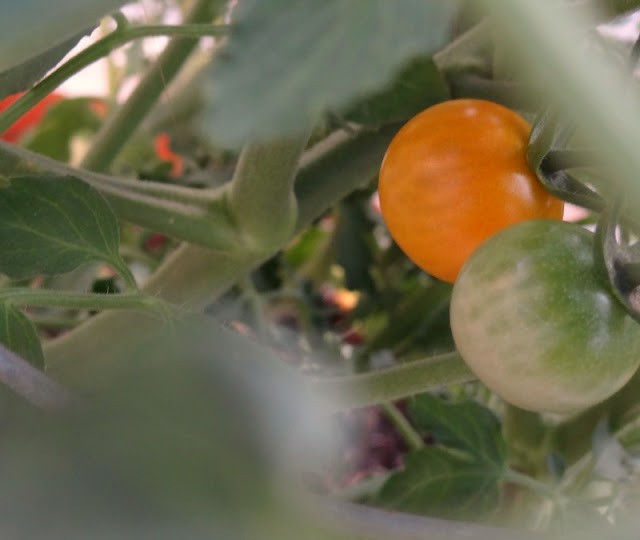 We're very excited about our "Little Orange Yum Balls" starting to ripen. Yay! That's our nickname for our very favorite tomato of all time.....cherry tomato sized, but are orange when fully ripe (never turn red) and are sweet as candy! Two firsts are promising yummy soon......hiding way deep within the huge potted plant. 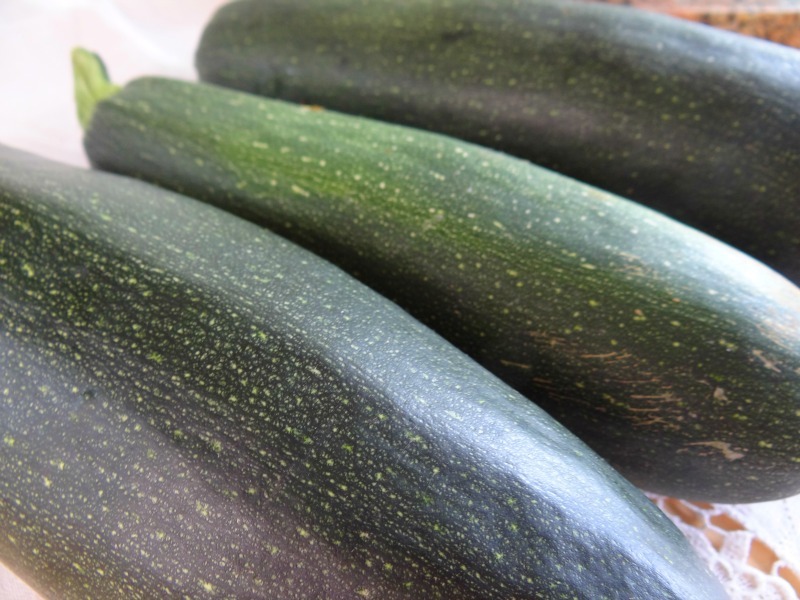 The zucchini is doing well this year - we've picked about a dozen so far. I made zucchini bread for a "tea party" yesterday - posted about it here . I shared a similar pic of this watering can full of our garden flowers in a recent post, but not this exact pic. I hope you think it's worth seeing again in a different setting. (Thanks for obliging me.) One can see a little bit more of my simple potting bench in this photo. I do love the sometimes vibrant colours of wildflowers! 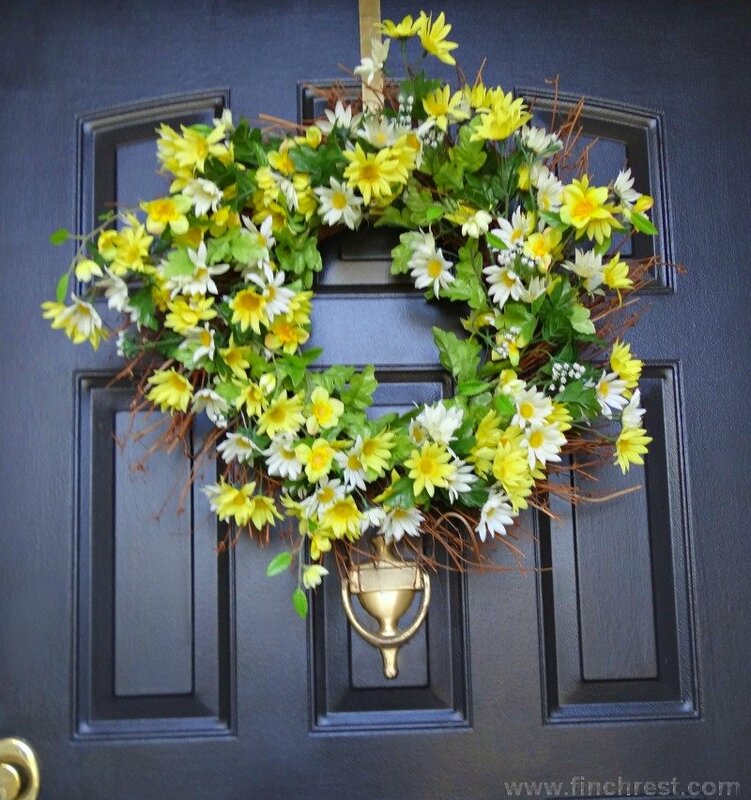 It is just so SATISFYING to see and know these lovely flowers were planted, nurtured, picked, displayed and loved right here at our nest......it's a great feeling to create beauty, isn't it? I really like the wild flower mix! That pink flower is so pretty! Thanks for sharing you heart today! I love wildflowers, Michele! I remember traveling through some states by car when we would be on vacation in awe that they'd planted wild flowers on those grassy divides. I don't think I'm going to get too many blooms from my hydrangeas. I planted them a week before the heat wave hit! I just make sure I'm out there watering them every day. Hopefully, it will help them get established and I'll have something to look forward to next year. Hi Michele, Your herbs look so great! Mine are not doing so well. It's so hot here. I think your hydrangeas will look better next year. Mine have done that some years, not too many blooms and then the next year they explode! I enjoyed all the pretty flowers, I like wildflowers also. My hubby used to plant them for our grandchildren when I kept them when they were little and my daughters worked. (I miss those days). Your garden looks so manicured and lovely! Those urn pots are just gorgeous!!! I am going to remember this for next year! Wildflowers make my heart sing! What beautiful flowers Michele. Mine have been neglected this year and are suffering from the heat. Yours look like they are being pampered and loving every minute of it. Michelle, you have a bit of everything!!! Beautiful wildflowers, herbs, lavender. lilies --- a beautiful! Your flowers are all gorgeous and it's so nice to have the fresh herbs. Your watering can is wonderful...thanks for sharing! I haven't seen it! Happy Monday! Wow, all your flowers are beautiful! 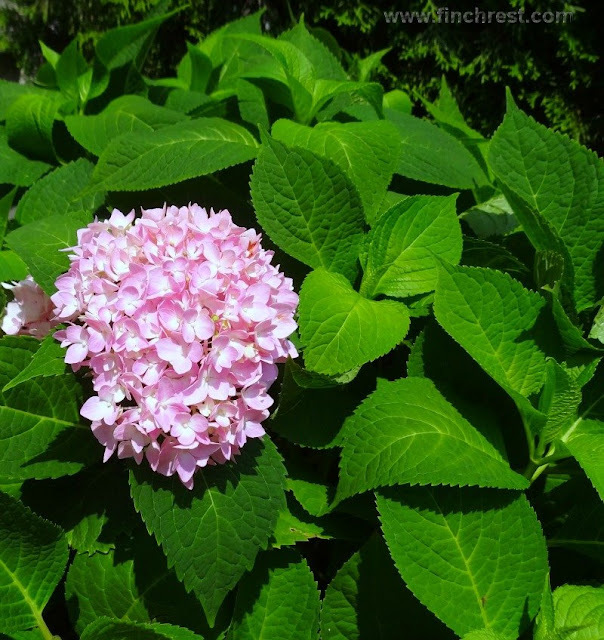 I have a hydrangea that is not, nor has it ever bloomed. I've just recently heard that coffee grounds make all of the difference? I've not tried it...but thought I would pass it a long anyway! 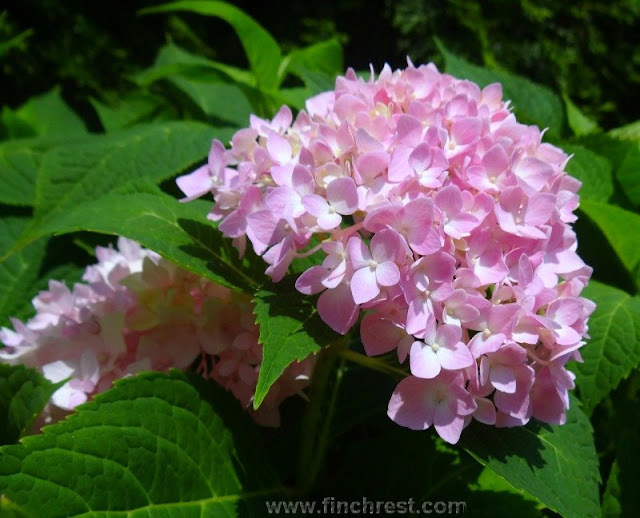 I do love hydrangea! Beautiful photos. I especially love the herbs. The clean fragrance brightens my spirits! Such pretty flowers! 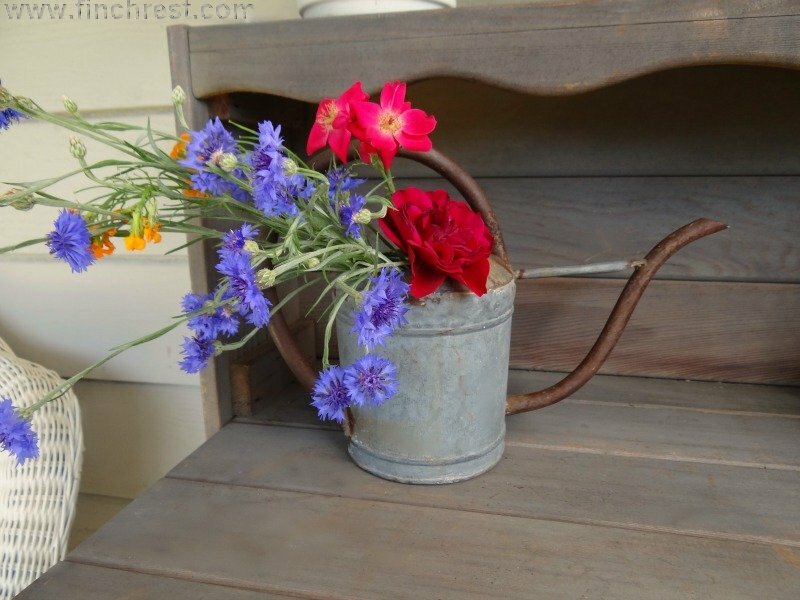 I love the photo of the flowers in the watering can. There's just something about those vibrant flowers against that rusty can that is fabulous. My hydrangeas are nuts! I hardly get any blooms. Last year I had so many, I couldn't believe it. This year, I have one single bloom! Drives me nuts. I read on Karianne's blog about adding coffee grinds to the dirt. I've added some, even though it's probably too late to take effect this year. 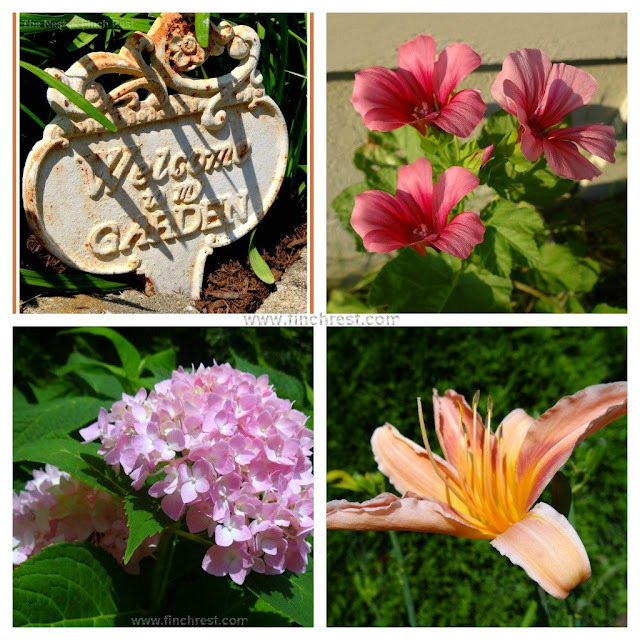 I love your lavender, wildflowers and day lilies...so beautiful! What a lovely poem...thanks for sharing. Have a wonderful evening. This is such a beautiful time of year in the garden. I love all your flowers, and the bouquet of wildflowers. Charming and pretty. Beautiful, lovely, delightful! I adore flowers and love your hubby's wildflowers. It's so nice to see your flourishing garden. Ours is taking a beating in the heat. Not that there is much of it to begin with! Thanks for sharing! Our hydrangeas are blooming this year for the first time - I don't know what I've done differently! The flowers are all so beautiful and those little orange cherry toms, YUM! I am smiling after visiting your wonderful blog. Oh I love your herb pot! Great idea! Hope you can stop by, say "Hello" and "Like" Hood Photography on Facebook! Thanks! Your flowers and vegetables look wonderful. As for the pretty pink blossoms, it looks like lavatera to me. All of your flowers are beautiful. 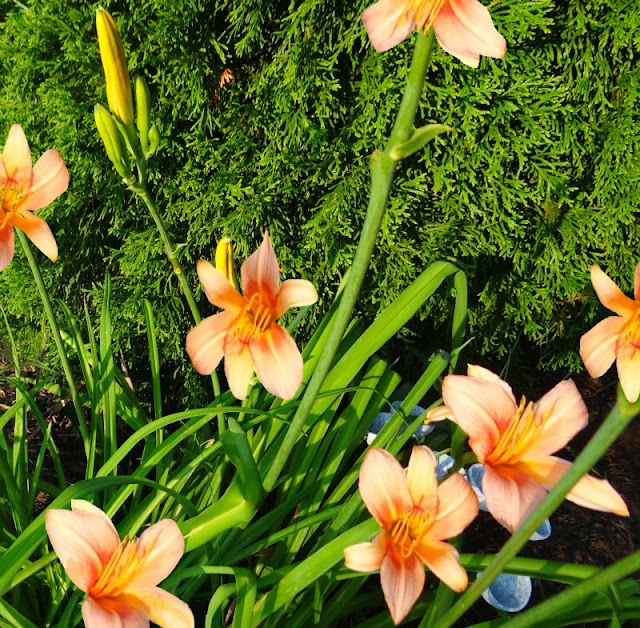 I love the color of your daylily. I do love the pink of your hydrangea. My hydrangea is getting battered by the sun the past few days. Trying to keep it well hydrated. Our soil is a little too acid for that to happen and they go blue. Thinking about manipulating the pH to get pink. Hi Michele: My first time to your blog. What a gorgeous garden, and that beautiful urn with the robust basil--I love it. Take care, and have a wonderful weekend!